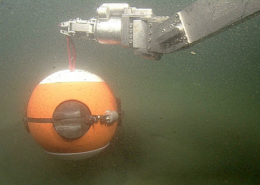 MBARI’s Ocean Imaging Group will conduct low-altitude seafloor surveys as part of the Coordinated Canyon Experiment, a two-year international effort aimed at obtaining a comprehensive view of sediment movement within Monterey Canyon. Dozens of sophisticated instruments placed in the canyon have been recording sediment-transport events for more than a year. The largest such event, in January of last year, was so powerful it carried heavy equipment five kilometers (approximately three miles) down the canyon. 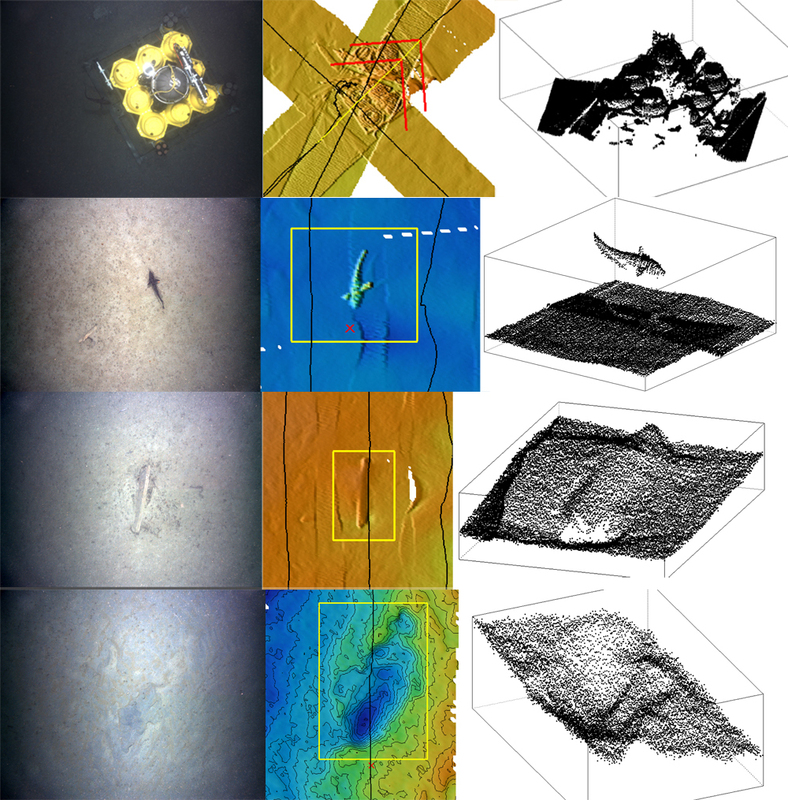 By imaging and mapping the seafloor repeatedly during the course of the experiment, the researchers can see, in great detail, just where the seafloor morphology has changed as a result of these events. During this expedition, the team will first survey the area around one of the instrument nodes at a depth of 1,850 meters. They will then move farther down the canyon to survey three sites the researchers are familiar with to see how they have changed, if at all, and whether the effects of the large event of last January can be detected at a depth of 2,850 meters. The surveys will combine lidar, multibeam sonar, stereo cameras, strobes, and an inertial navigation system (INS), flying just three meters above the seafloor. This imaging system is mounted on the remotely operated vehicle Doc Ricketts, which will run the surveys all day. When the vehicle is returned to the ship at the end of the day, the research team will work late into the night to process the new data. The work completed this week will be very helpful for Scientist Charlie Paull as he plans his Western Flyer expedition scheduled for next month. Paull’s team will be collecting instruments placed in the canyon for the Coordinated Canyon Experiment, and will collect samples at key locations in the canyon. The images and maps from this week will help his group determine where to take sediment cores. As for the Ocean Imaging Group, they will be back out at sea later this year to test and refine a new version of the survey system designed to efficiently map steep slopes as well as flat regions like the canyon bottom. 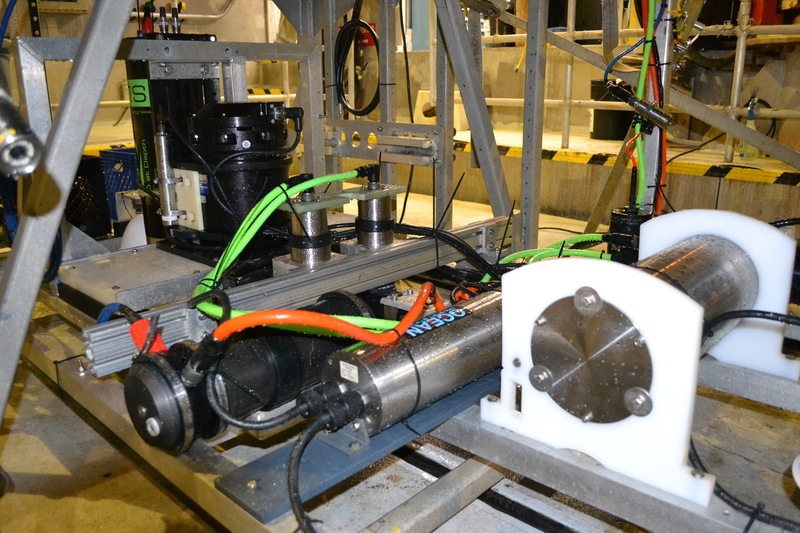 Team members Eric Martin, Andy Hamilton, and Larry Bird have designed and built a frame that allows the imaging instruments to tilt to follow the shape of the seafloor, even up to vertical cliffs. Next year they plan to use the improved system to survey a lush coral and sponge community on Sur Ridge in the Monterey Bay National Marine Sanctuary. Following that expedition, the imaging system will be taken to the Pescadero Basin in the Gulf of California to survey hydrothermal vents discovered by MBARI in 2015. The smooth operation this week of a very complicated array of imaging systems is the result of more than six years of development, sea trials, expeditions, and successive improvements. Only a part of the team that made this possible came out on this expedition—David Caress, Eric Martin, Mike Risi, Erik Trauschke, and Monica Schwehr. Hans Thomas, Rich Henthorn, and Brett Hobson were integral to the pre-expedition preparations. See the full project team at the bottom of this page. 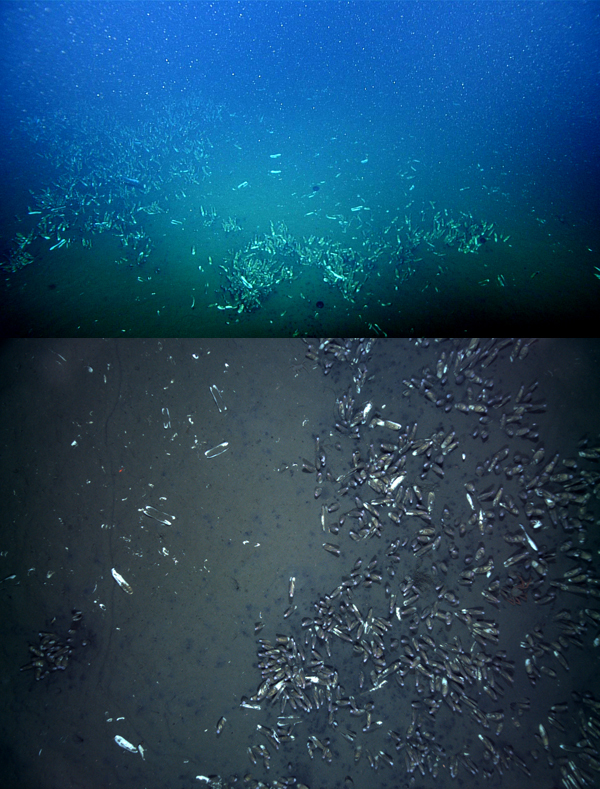 Images created from two days of surveying an extensive clam field in Monterey Canyon are impressive for their level of detail—especially when you remember that these pictures are coming from more than 2,800 meters deep (about 1.7 miles) in the ocean. The surveys answered some science questions about this site. First, they showed that the turbidity current that moved a large amount of sediment down the canyon early last year did not make it this far. 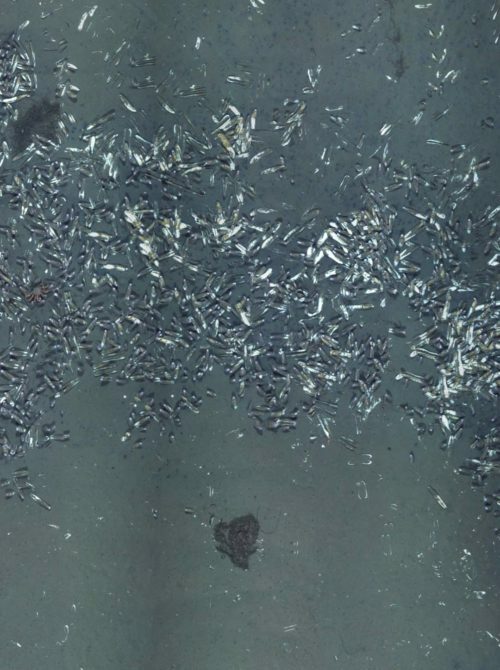 Second, it showed the boundaries of this particular clam field and documented the density of clams here. These images will also be compared with six earlier surveys in the same location to determine how the clam field may have changed over time. 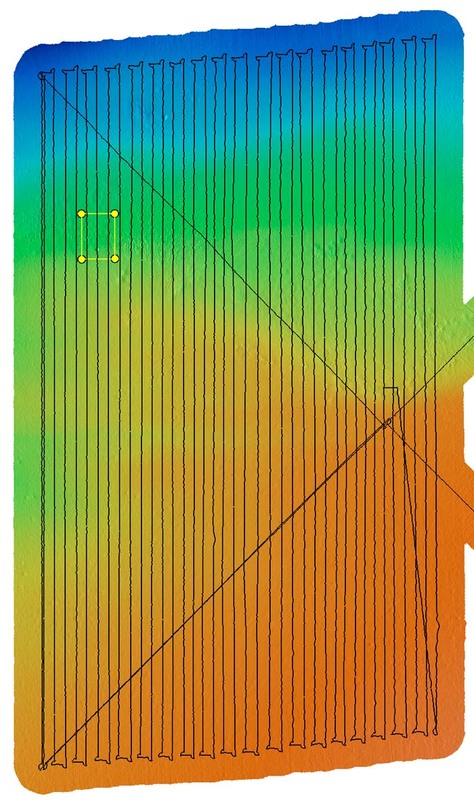 The raw data from the lidar surveys come in as points from each location where the laser beam hit the bottom, as seen in the images posted earlier in these logs. 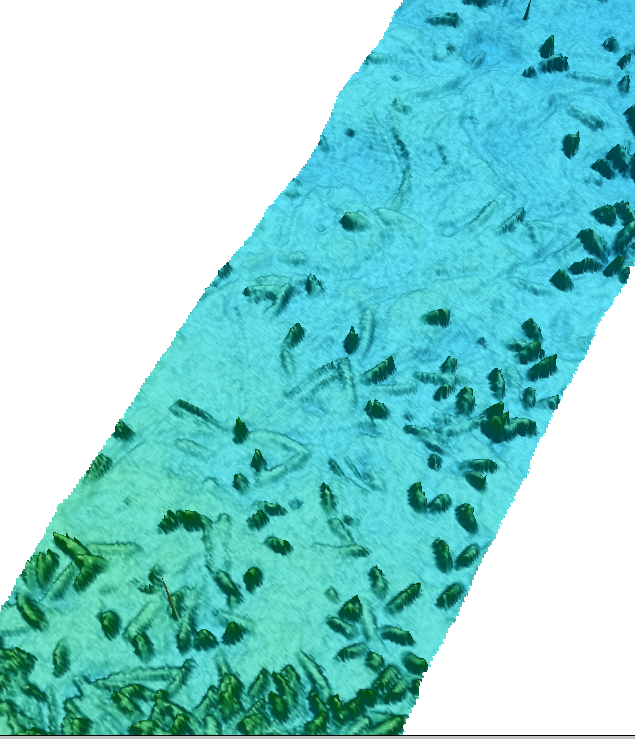 Postdoctoral Fellow Monica Schwehr then processes these data to create images such as the one above, revealing details as small as one centimeter in size. The green objects here are clams. Notice that the tracks made by the clams’ movement across the seafloor are evident in this image. The range of colors depict slight variation in, and simulated illumination was added to make it easier to see the objects. The width of this image represents a swath of the seafloor 1.6 meters wide. Click on image for larger version. Photos taken with the stereo cameras can be meshed into one large image. David Caress created this mosaic with software that matches up the overlapping parts of the images, and projects the images onto a seafloor map created with the multibeam sonar data. This image covers an area measuring 4 by 6.5 meters. Click on image for larger version. This area in the image from the lidar data corresponds to the area covered by the mosaic image above. Click on image for larger version. 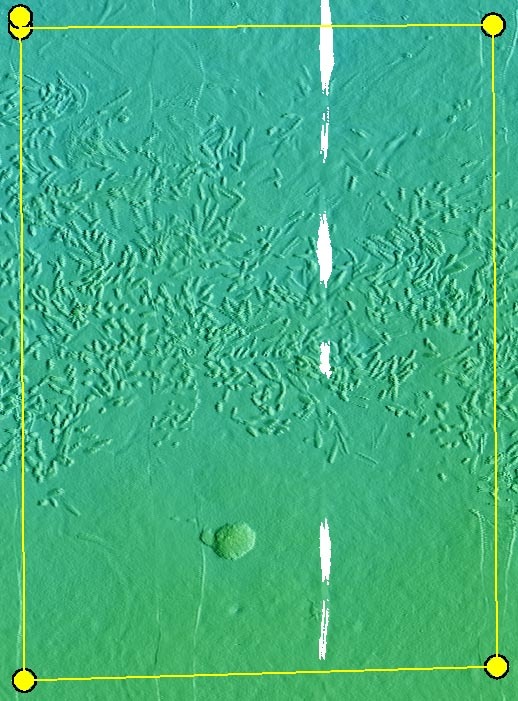 The vertical lines in this multibeam map are 100 meters long; the small yellow box indicates the area shown in the mosaic image above. Post-cruise processing will produce a mosaic image of the entire survey area. Click on image for larger version. 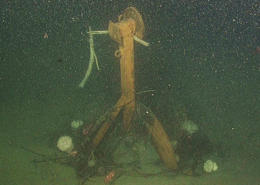 When the ROV Doc Ricketts arrived at an extensive clam bed deep in Monterey Canyon this morning, it was soon evident that things had not changed drastically since the last time the site was mapped by David Caress and his team. That answered the first question of the day: Did the large turbidity current that moved a massive amount of sediment from high up Monterey Canyon in January 2016 travel this far? Obviously not. This is an important piece of information for Scientist Charlie Paull and his colleagues who are studying the movement of sediment in the deep sea. But Paull is looking not only at major changes in the shape of the seafloor, but also for small changes in texture that can indicate the movement of sediment. Today’s low-altitude survey conducted with the lidar, multibeam sonar, and stereo camera will provide the close-up look to determine if there have been those fine-scale changes. About half of the 100-meter-square survey area was covered today before high winds required bringing the ROV back up to the ship a little early. Tomorrow the team will continue the survey of this clam bed at 2,850 meters depth. 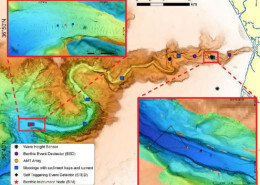 The results of these surveys will be compared with maps of this same site from six previous surveys conducted from 2012 to 2014 to learn more about where and how the seafloor is changing. Above, a frame grab from the video of the clam field surveyed today. If we were doing just a video survey, we would fly the vehicle closer to the seafloor, and the video would be sharper, but at the cost of covering a narrower swath (one meter) of the seafloor with each pass. Below, an image from the stereo camera system in use on this survey provides greater detail over a 4.2-meter-wide swath of the seafloor. 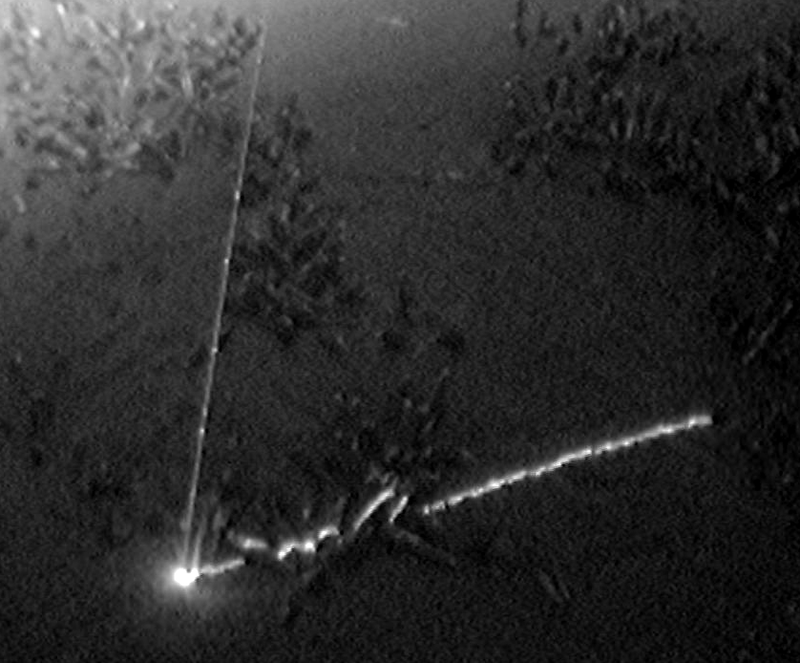 The laser beam of the lidar imaging system sweeps back and forth over the clams; the length of time it takes for the laser light to bounce back indicates the terrain. On many cruises, the science team spends hours in the lab processing biological and geological samples after a full day in the ROV control room. This cruise is different—the focus is on technology, not samples. Left, Software Engineer Mike Risi, who wrote the code for the ROV to run autonomously on a preprogrammed path over the survey area. Right, Operations Engineer Erik Trauschke, is our expert on the inertial navigation system running in the imaging system. Also aboard is Electrical Engineer Eric Martin, who manages the lidar imaging system. While it has long been possible to capture video and still images in the deep sea, most cameras used at depth have a very limited field of view and—unless the water is perfectly clear—must be very close to their subject matter. The stereo cameras used in this week’s low-altitude surveys offer a major advantage to scientists who want to assess wide areas of the seafloor. These cameras mounted under ROV Doc Ricketts take pictures every two seconds as the ROV is flown in a lawn-mower pattern at two-and-a-half-meters altitude over the area of interest. MBARI Mechanical Engineer Brett Hobson took special care when designing the housings for the cameras to assure that the images were free of distortion across their wide field of view. Each image overlaps a bit of the area of the previous image, which makes it possible to stitch them together as a mosaic of the entire survey area. The day’s survey began at the benthic instrument node. The ROV then flew an automated course to cover much of a 100-square-meter area surrounding the node, which is the area that experienced a large deposit of sediment in January of 2015. The day ended with a detour to a known rock northeast of the node, where it was learned that the large event of last year did not reach this spot; the terrain had not changed much since it was last surveyed. The following preliminary images show the results of the different imaging systems. When all the data are processed, they can be meshed together to show large areas and can be used to compare with images and maps from previous surveys. Software Engineer David Caress, who leads the Ocean Imaging Project, reviews the day’s multi-beam seafloor mapping data with Postdoctoral Fellow Monica Schwehr. Photo by Nancy Barr. 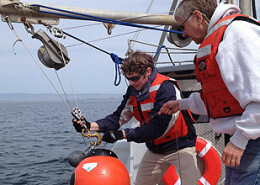 The first low-altitude survey of this expedition centered on an area surrounding an instrument node located about 30 kilometers offshore at a depth of 1,850 meters in Monterey Canyon. Here’s how it works: Four systems record data as the ROV runs a preprogrammed path across a 100-meter-square section of the seafloor. The multibeam sonar system sends sound waves toward the bottom; the time it takes for the sound to bounce back indicates the depth. The lidar system is similar in terms of sending a signal to the seafloor and recording the time it takes to bounce back, but it uses laser light beams instead of sound. Two strobe lights fire to provide light for a stereo-image camera system that takes photos as the ROV flies just two and a half meters above the bottom. Finally, an inertial navigation system records the speed, orientation, and velocity of the vehicle—important information for helping to tie all the data together. The sophisticated imaging, navigation, and mapping equipment are mounted in a tool sled under remotely operated vehicle Doc Ricketts. Photo by Dave Caress. On a full-day’s ROV dive, these systems would bring back more than a terabyte of data, which researchers then piece together to create detailed seafloor images. Processing that much data continues late into the night, so images are not immediately available. 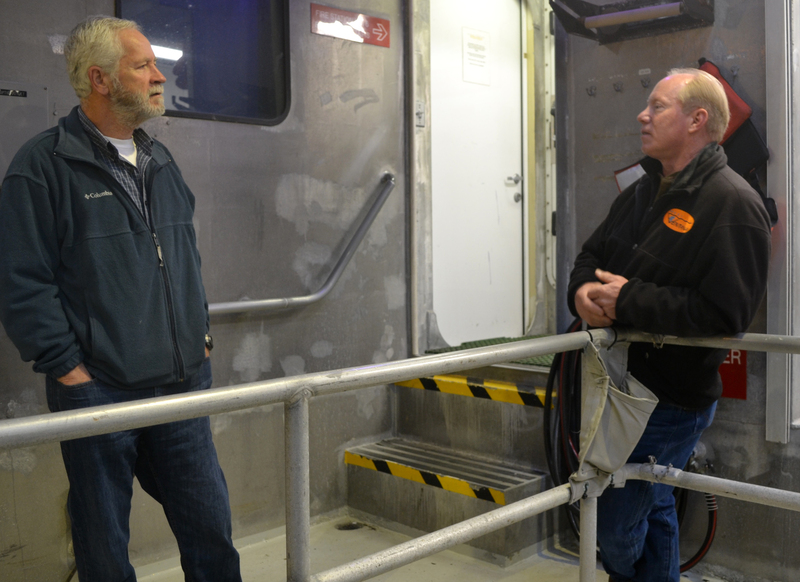 Scientist Charlie Paull, left, met with Chief ROV Pilot Knute Brekke on the ship before the cruise. Paull is looking forward to seeing what the data collected on this cruise will reveal about the changing shape of the seafloor. Photo by Dave Caress.